There's something about soup that draws me in every time I have it. Throw in noodles of any sort, and you'll find it on top of my list of most craved-for dishes. I remember that my mother made soup for us just about every meal together whether it was as a starter or the entree. It's a comfort food and considering how often I would get sore throats (cursed I tell you!) 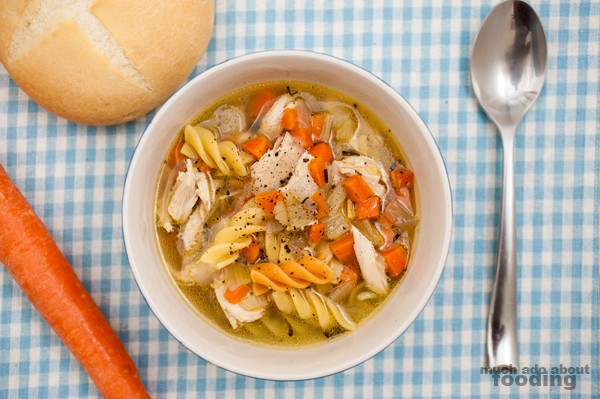 in my teen years, I relied on soup to feel better. 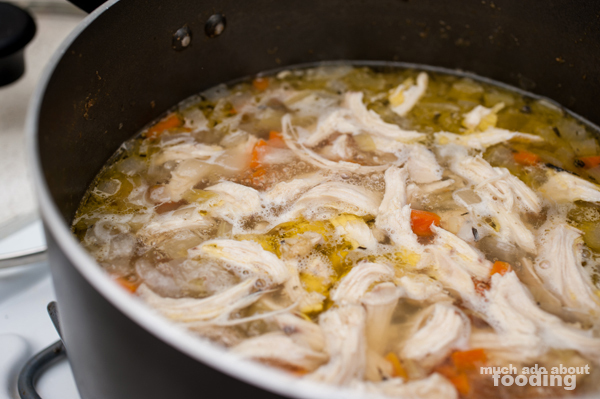 Chicken noodle soup was one of those that I could more easily attain though as I did not have the know-how to make what my mom could. I sought it frequently at restaurants or asked people to bring it by when I was feeling under the weather but as I have found over the years, it's hard to beat making dishes yourself. I finally got around to crafting this completely from scratch the other day because I had a bag of mirepoix in the freezer that I had stuck in before and needed to use. It was excellent and a much better way to have some without wondering what went into it at some restaurant. 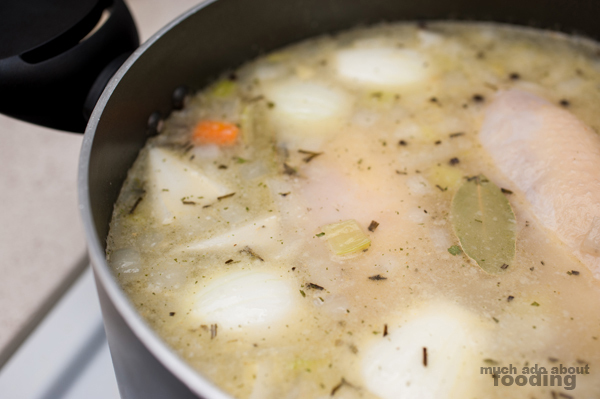 With this, the chicken stock was not added but made in the process of making the soup itself. Dice all vegetables as needed (can use pre-prepared mirepoix mix if desired). 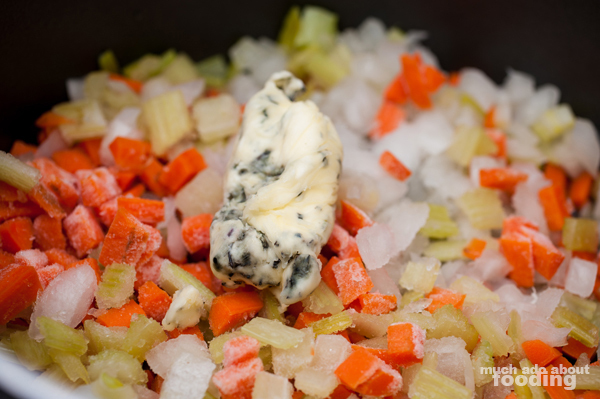 Sweat in a large pot with rosemary butter (how to make it here) on medium heat. When the vegetables have softened but not gotten to the browned stage, you can add in all remaining ingredients except for the pasta. The water should barely cover the top of the chicken breasts. Bring to a boil. 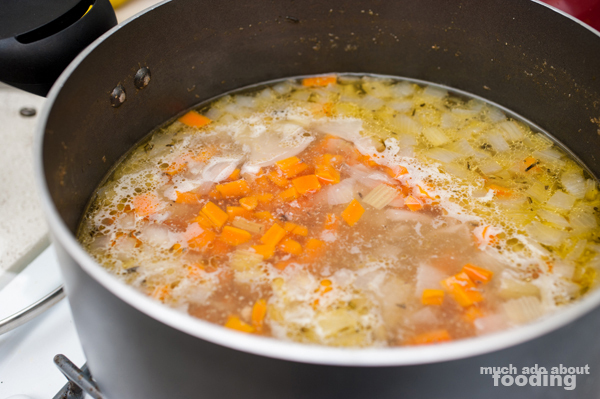 Once the soup has boiled, reduce to low heat and let soup simmer with the lid on for 1-1.5 hours. Make sure to skim the top every once in a while for fats that rise. 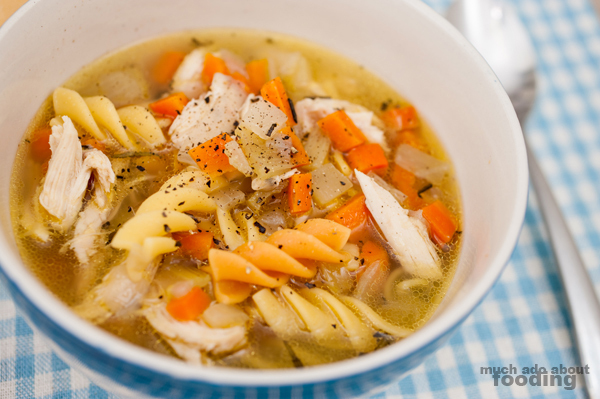 The chicken breast will certainly make this a leaner soup but the inclusion of its skin gives a richer fattiness that will show itself in the soup's flavor but you don't have to drink it all down. After the simmering period, remove chicken breasts and shred by hand (when it has cooled enough); remove skin. You will most likely only use only 1/2 of a breast's worth of meat. Reserve the rest for future usages. Skim soup again before adding meat back in. Approximately 7 minutes before serving, add in the pasta and let it cook. Turn off heat. Remove bay leaves and skim one more time. Serve soup with freshly cracked black pepper if desired. Enjoy! Some of the background shots are amazing.